The A3 has been a massive sales success for Audi. The combination of the iconic badge on a family hatch has proved a winning formula. 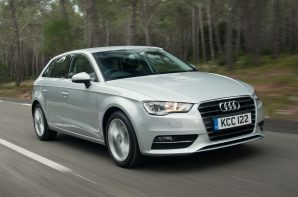 The slick marketing, and indeed the lofty asking price suggest that the A3 is a cut above the many mainstream offerings in this class, but is that reputation justified? The first thing to say is that the A3 is a good looking car. Audi has perfected the ‘hwen from rock’ look, and whilst there is no doubting the road presence created by the huge grille, overall the A3 is quite subtle. On the inside the dashboard is clean looking but particularly in SE trim it does look very basic, not helped by the manual air conditioning controls. The truth is that even mainstream rivals deliver more interesting interiors which not only look more interesting but also look more sophisticated. It’s a similar story on the mechanical front, the 1.6 TDI engine provides average performance and good but not class leading fuel economy. Thankfully the days when Audi fitted back breaking suspension to a family car are gone. The A3 rides very well but show it a corner and you quickly realise that whilst it is composed and grippy there is no fun to be had. Many of the competitors do a better job of balancing ride and handling, which makes you wonder why Audi can’t. The A3 is feeling its age a little. It doesn’t have the best interior in the premium sector, and it is even bettered by many mainstream models despite being more expensive and it also fails to engage the driver. However for many buyers the pull of that iconic badge is too much to resist.